Our office has been serving Honolulu with quality, professional dermatology care for over 30 years. Our Board-Certified doctors are dedicated, with a strong commitment to quality and outstanding patient care. We are always there when you need us with unparalleled access to our doctors. Your appointment is always with a Board-Certified Dermatologist and there are no long waits for appointments. We will always find time for patients who need our care. Our dedication reaches outside the office. 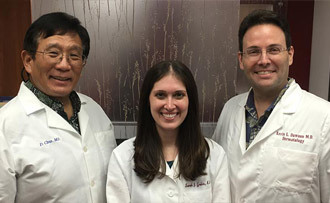 Our doctors are leaders in the community, with appointments at the Queen's Medical Center and the University of Hawaii John A. Burns School of Medicine. We are committed to the community through education of medical students, teaching our new doctors, and year-round involvement in community service. Commitment to excellence, dedication to our patients, service to our community. That's dermatology with a difference. All other disorders of the skin, hair and nails. NEW! SculpSure Non-Invasive Body Contouring in just 25 minutes! Click here for instructions on your patient portal.